Welcome to the recently renovated Holiday Inn Select Strongsville. 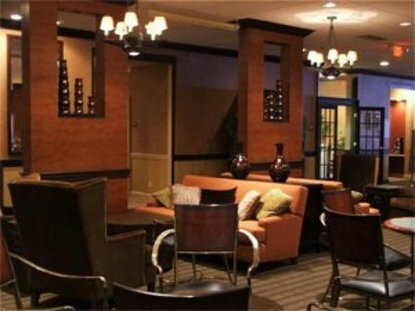 We are 100% non smoking The hotel features Barnies Gourmet Coffee shop, a state-of-the-art business center, one of the largest indoor pools in Cleveland, a fitness center, a full-service restaurant and lounge, and 13,000 square feet of flexible meeting space. The beautifully decorated deluxe guest rooms also feature complimentary wireless high-speed Internet access throughout the hotel. Complimentary Ruckas WiFi Internet in all the meeting and banquet rooms. Come experience the exceptional world of comfort and style at the Holiday Inn The all new Holiday Inn Select is located in the heart of Strongsville, one-half mile from Westfield Southpark Mall, Iceland USA, and 8 miles from Cleveland Hopkins International Airport (CLE). The hotel offers a complimentary shuttle to and from the airport, and has park and fly packages available. The Holiday Inn is located only 15 minutes away from downtown Cleveland, Quicken Loans Arena, the IX Center, MetroParks Zoo, Rock-n-Rock Hall of Fame, Jacobs Field, Cleveland Browns Stadium, and the Theater District. Local companies include Ernst & Young, MTD Products, PPG Industries, Ford, National City Corporation, ICI Paints, General Motors, American Greetings, Avery Dennison, Sherwin Williams, and RPM Inc. You will find the Holiday Inn Strongsville to be the perfect location to meet all your business and leisure needs This hotel is committed to providing accessible facilities under the American Disabilities Act. If your accessibility needs are not met, please contact the Hotel Manager on Duty. Should you require additional information regarding accessible facilities for guests with disabilities, please call 1-800-Holiday (U.S. and Canada) or contact the hotel directly. For the hearing impaired, TDD service is available at 1-800-238-5544 within the U.S. and Canada.